The sensitivity of scientists towards teaching or, better, education of future professionals in science is, fortunately, increasing. The topic proposed by the editorial board of the journal of the Spanish Society of Biochemistry and Molecular Biology is a proof of that. The Dossier –main thematic section– in the March 2019 issue (number 199 of the journal) has been entitled "University Education in the Modern World". The contents were published in Spanish in the journal (printed and online) and we are sharing them here in their English versions (electronic only). If I was taught that way, why won't it be good that I teach in the same way? In summary, all responsibility for learning is laid on the students, without reflecting on whether we are facilitating it adequately. But society changes, as well as environments, means, people’s priorities. We all know science progresses at an extraordinary pace, but sometimes it is not considered that, precisely because of that, new strategies should be adopted to prepare the professionals of the near future. It is commonplace to cite that a good part of our students will work on jobs that do not even exist yet. And this must force us to think and evolve. Due to all this reflection and uneasiness, which is particularly evident when one leaves the homeland and contacts with people from other places, it was more than welcome and commendable the editorial decision of choosing education for the March dossier. The confidence of the editorial board fell back onto me, and my challenge has been to properly shape this initiative. 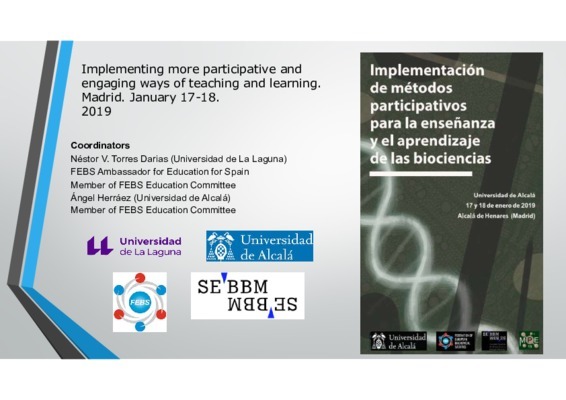 I do not consider myself an expert, but at least concerned about educational topics in biochemistry and somewhat knowledgeable thanks to years of contact with colleagues from here and there, mainly through activities developed with FEBS Education Committee. Other approaches might certainly have been possible, and many valuable persons could have contributed with their experience to this dossier. At least we managed to collate a group of four articles with national and international authors, all of them –again– with a clear concern for the efficiency of their teaching activity. It is this, more than an ability to indoctrinate, what made me select the authors. In advance our appreciation to them all for their generosity in setting aside some, always precious, time to prepare these contributions to SEBBM Journal and now also to FEBS Network. They are not going to improve their professional expectations for promotion nor their h index, but it will bring inspiration to many readers and will encourage all of us for the needed change. Why should I need to study chemistry? I just want to be a medical doctor! It is also interesting the presentation of diverse modalities that may be implemented for an integration of disciplines. People do not develop a true understanding just by passively listening to some explanations. The third contribution comes from Emily Coyte and Bill Heslop [read their post], who work in a young company in the UK, Learning Science, with a bet for developing technical resources with a strong focus on optimising the experimental learning. With them we can learn approaches and tools to help our students along a more efficient development of their learning in laboratory practicals, that part of our courses which is always very important on paper but in fact suffers from many limitations and difficulties. Materials from Learning Science, which you are invited to know, may prove enriching to prepare for and to complement activity in the laboratory; however, one should not restrict to a mere exploration of resources we could adopt, but it is essential to perceive the background message conveyed by this article, related to achieving a laboratory experience that is profitable and efficiently embedded in learning the subject as a whole. Finally, we benefit from the contribution of Gül Güner, from Turkey [read her post]. Gül has chaired FEBS Education Committee for about 10 years (nearly since its creation). Consequently, her experience is noteworthy on developing teaching innovation, approaches to focus on student learning, and the different but also similar realities that happen in diverse countries. She presents us a valuable vision on student training for a transnational space, with emphasis both on pre- and post-graduate stages. She summarises as well several considerations relative to how educational institutions should reconsider their strategies so as to take into account opening towards other environments and connections between centres, communities and countries, as part of their training plans. I wish that reading this set of articles will bring you enriching visions and reflections that may help us all to pursue this small revolution which is needed in laying out our task as trainers of the young scientists and professionals. Associate Professor of Biochemistry and Molecular Biology, Dept. of Systems Biology, Universidad de Alcalá, Alcalá de Henares, Spain. 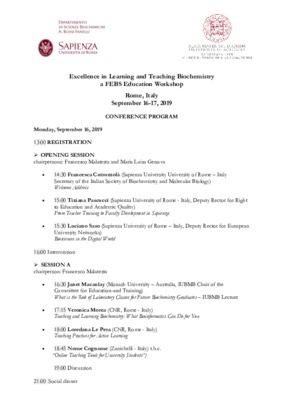 Member of FEBS Education Committee since 2012. This article is the introduction to a Dossier on University Education first published, in Spanish, in the March 2019 issue of the SEBBM Journal.